The most famous park in Florence is undoubtedly the Boboli Gardens, but a true paradise hidden from the eyes of most, and often misunderstood even by the Florentines, is the Bardini Gardens. On the steep bank of the left bank of the Arno, as early as the 13th century, the Hubs, rich bankers, had behind their palace the hortus conclusus, and in the rear part and higher terraces for agricultural use. From the seventeenth, but definitely in the nineteenth century, the slope, which rises steeply up to the San Giorgio gate, acquires the character it has today becoming a garden pertinent to the Villa now Bardini. There are numerous changes of ownership and transformations, in an English garden, in Anglo-Chinese and then romantic. However, the definitive destiny is decided by the volcanic antiquarian Stefano Bardini's purchase in 1913. He makes the garden a spectacular open-air showroom and places a loggia at the top from which an excellent panorama can be enjoyed. Bardini's customers, after visiting the halls of his antique house, remained captivated by the magic of the place and became more compliant to his proposals. Bardini garden roses The garden has many attractions throughout the year. In winter when nature hides its most evident beauties from our eyes, the Bardini Garden becomes a place where you can admire a forest of holm oaks, evergreen trees, the so-called English forest crossed by the Dragon canal. The silence and the quiet will make you feel far from the city, which at the same time you will see near and beautiful in the views that open from the terrace of the villa and from several other panoramic points. 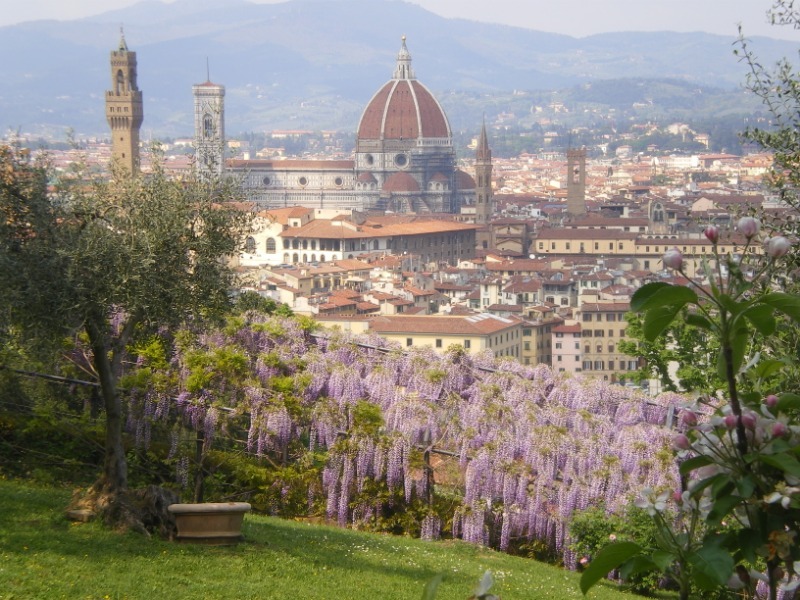 The view from the Bardini Garden is without statues Bardinidubbio garden one of the most beautiful, to your view the modern part of Florence is precluded, and it seems to make a journey into the past admiring only that part of the city that was enclosed in the ancient walls. Walking through the garden you will find artistically arranged statues that will lead you into the world of Arcadia, and you will return to a world of gentle peasants and damsels similar to nymphs, and in which Bacchus and Ceres cheer up each other with reciprocal gifts. Caves, niches, sculptures are arranged along the avenues, on the terraces and decorate among other things the spectacular Baroque staircase. And these views that make the visit of winter unforgettable, are enriched with the arrival of the spring of the beauty of the garden, the flowers. The Bardini Garden promises you a prolonged and varied calendar of flowers. Beginning in March, April blooms at the bardinicon with camellias, fruit trees and viburnum, which bloom until July. From April to May the Judas tree covers its cyclamen-red flowers and in the upper part of the garden in March they give us the beauty of their intense flowers and perfumed camellias. Immediately in April the azaleas begin to bloom, of which there is also a wide variety, with their pink, red and white flowers. Certainly spring is the time of greatest rejoicing, from March to April bulbous plants follow, then irises in May, which continue to give us their blooms in the different varieties between June and August and even in November. The flowering of the wisteria, which starts in mid-April and lasts until mid-May, is exceptional and theatrical. In the Bardini garden you pass under a pergola of wisteria hanging to form a roof of flowers on our head. Hydrangeas are waiting for us from May to July under the circle of wisteria, there are about sixty varieties. And how to forget the roses, the queens of all the gardens, of which there are some hanging, planted to form espaliers, or bushy, and which from June to September will accompany us with their perfume and their precious beauty. If in the spring the walks in the Bardini gardens will fill our eyes with the variety of the colors of the flowers, during the summer you will find in the Garden not only the possibility of escaping the mass of tourists, who crowd the streets of the center, but also the coolness in the shade of the trees and under the panoramic loggia, where a cafeteria is placed. Anyone wishing to enter the Bardini Garden can do so after visiting the Boboli Gardens by showing the same ticket. The visit is also possible separately and access is either from the Villa Bardini on the Costa San Giorgio or from the Via dei Bardi.